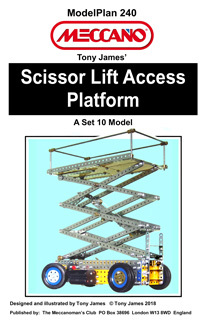 A supplement to ModelPlan 237, which by lifting the restriction in that plan to parts contained in a Set 10, offers major improvements to the realism and operability of the model. The chief of those are real, working caterpillar tracks and also a geared reversing mechanism and a thrust bearing proper to give the superstructure greater stability. 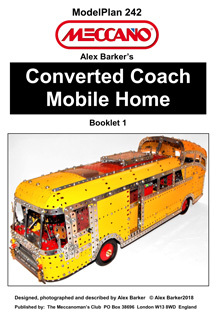 8 pages including text, colour photographs and additional parts list. With a compact 3-speed and reverse gear box, gear selector lever, working clutch and brake foot pedals, front wheel steering and rear wheels powered by a PDU motor, the model includes realistic details such as a fully furnished interior with passenger seats upstairs and down, driver�s seat, a curved stairway at the rear, handrails, destination and route number boxes, licence plates, headlights and wing mirrors and radiator grill designed with strips. With and colour and black and white photographs. 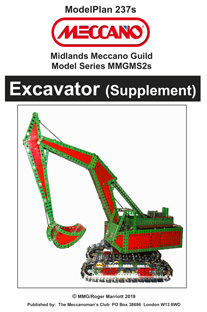 A revised version of Model 8.5 from the 1956-1961 Set 8 instruction booklets, enhanced for construction with the parts contained in a Set 10, with the luffing of the jib and the sliding mechanism for the digger bucket now motorised, powered by two PDU motors, and incorporating many other improvements to the model's appearance and realism. A finely-detailed model an early-1950's "Observation Coach" converted into a luxurious mobile home. The chassis has a 3-speed and reverse gearbox, clutch, differential, working steering, clutch and brake pedals, leaf-spring suspension and a rear engine compartment with working pulleys and fan, all driven by a PDU motor. The interior is packed with interesting details including skylights, hinged and sliding doors, seats, a folding table, fully-fitted kitchenette, shower and lavatory, cupboards and stairs to the bedroom in the upper floor. It even has a TV, taps, sink waste, cooker knobs and burners, bedside light and toilet roll holder. 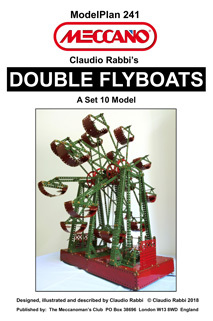 The plan, in two volumes, includes text and over 60 photographs. A development on Liverpool Super Model No. 33a, a large, classic exhibition model, adapted for building within the constraints of a Set 10. Powered by a PDU motor, improvements include the concealment of the motor and intermittent drive mechanism inside the plinth. 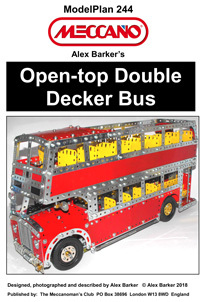 12 pages with text, colour photographs and parts list, plus separately-stapled Super Model Leaflet No. 33. Powered by a Meccano "Cube" motor, with steering, forward and reverse movement, and platform raise and lower functions controlled from the rear end. To help the lifting action, the cord from the ram is routed to pull the front leg rearwards. 16 pages including text and colour photographs, plus a separately-stapled, 8-page booklet of diagrams with parts list. 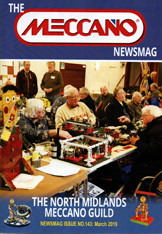 Supplied free to its members by the North Midlands Meccano Guild, the largest of the UK Meccano clubs, the latest issues of The Meccanoman's Newsmag are now available to non-members. 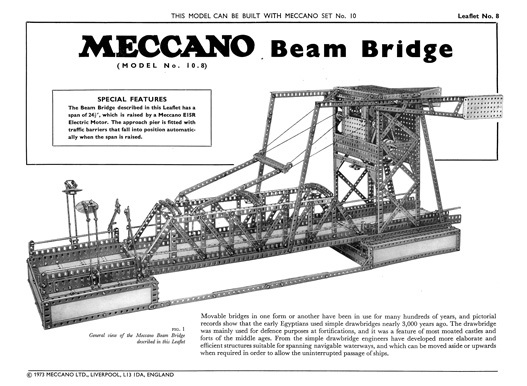 The Newsmag (AKA 'NMMG Newsletter', 'NMMG Newsmag', 'The Meccanoman's Newsmag' and 'The Meccano Newsmag'), one of the best-known of the internationally-read Meccano journals, has been in continuous publication since 1977, and is a great resource and archive of Meccano-related material and of the Meccano hobby itself. That Cyclic Sindwinder (Rob Mitchell), Meccanographs Part 4 (Jonathan Shapero), Diary Dates, Skegex 2019 (Geoff Brown), A "Witch Hunt" at Binns Road (Jim Gamble), Notes & Quotes, Clubscene Oxton in January (Meeting, Auction Report & Model report), Cold Sheet Metal Roller (John Ansell). Ref: MN143 Price: �7.00 (postage extra; budget UK rate available). 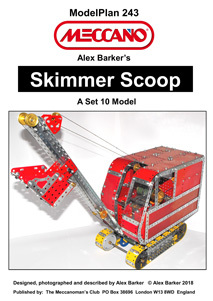 Back Numbers of the Newsletter of this premier UK Meccano society produced between 2006 and 2017 by editors Chris Bourne and Bob Palmer, containing a unique mixture of ephemera, archive-quality material and humour. Unused, mint original examples of this now rare-as-hens-teeth leaflet. All leaflets available individually; see Set Manuals for complete list.